History – SWM began in the fall of 1966. 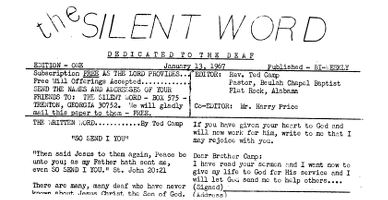 The following January, the first publication of “The Silent Word” newspaper was published – printed on both sides of one page and sent to 50 homes. Silent Word Ministries has grown to also include an extensive publishing ministry for Deaf people and deaf ministries, the Deaf Bible Institute (DBI), the Teaching and Training Bible Institute (T&T), SWM Northeast, the Silent Word Mission Board (SWMB), and SWM International (Foreign Missions). We just completed the annual SWMB Missions Retreat. At this time, SWM has 14 families serving as either vocational missionaries or in the Ministry of Helps. Three of these missionary families are raising support to serve on foreign fields. Numerous local volunteers help send the Silent Word Newspaper and keep the SWM office well-maintained and clean. More distant volunteers also visit and help in their areas of expertise. It is a joy to serve the Lord at SWM! Ambassadors – SWM is a unique missionary deaf ministry. We only build as the Lord provides. It is a blessing that Silent Word Ministries remains debt-free. Thank you for helping and praying so we can “give ourselves…to the ministry of the word – to Deaf people worldwide.” We realize that God does not call everyone to the deaf ministry, but He does call some. I am, and we are, thankful He called us. Through the many long hours of ministry, teaching, preaching, traveling, and preparing, I recently realized… our ministry is not a job, it is a joy! Thank you for the privilege to serve as your ambassadors to the Deaf World!